Forget about weapons to fight zombies. Are there enough calzones for everybody? 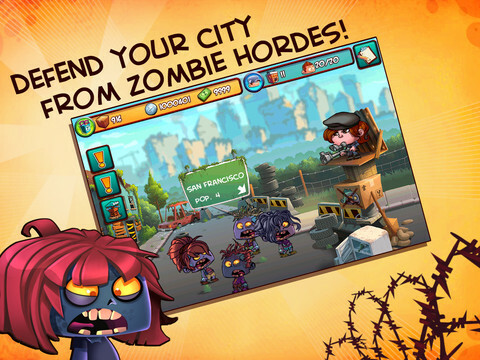 If you play free iPhone and iPad games on a regular basis, particularly time management/world building ones, then you've already played Booyah's No Zombies Allowed. The premise will be unlike anything you've seen in a title starring flesh eating monsters, but rest assured that the constant temptation of making an in-app purchase is alive and well, largely because the developers shove it in your face. Is there fun to be had? Sure, but it'll cost you. We'll start with the good. No Zombies Allowed ditches the high-level of gore normally associated with the undead in exchange for building a town during the zombie apocalypse and welcoming survivors. From there, it's all about launching businesses (be it pizza parlor or circus, among others) and putting these people to work, the goal to create a thriving economy that results in a sizable amount of virtual loot, which you'll then reinvest in housing. Why is that important? The more housing, the more survivors the game lets you accept. The more survivors the game lets you accept, the more businesses you can have. If this sounds like real life, it kind of is, aside from the rotting corpses near the front gate. You can even fire and evict these folks, or earn bonuses on products sold by pairing the right type of person with a specific establishment. Loners, for example, work best at the comic book shop. In addition, the game uses location data to pull a list of businesses within the area. From there, you can send people on fictional runs to grab supplies. There's even a mini-game where you must fend off a small band of zombies to complete the trip, tapping these suckers to fill them holes. The same holds true at the aforementioned front gate, where Lola the Sniper stands watch. See a zombie? Simply press the sucker to put a bullet in its head and then collect the supplies and silver coins it leaves behind. While on the subject of resources, this is where No Zombies Allowed stumbles. Those coins help you erect new businesses and housing. Doing this takes time, from a minute to even an hour. You can put the iPhone or iPad down and come back to it later (townsfolk continue to work), or speed things along with bucks. Acquiring bucks normally, however, is next to impossible, and the game rewards you with a single dollar here or there. That's a huge buzz kill when it takes four bucks to unlock a shotgun. That said, two things wind up happening. You leave the game alone for several hours, or succumb to the IAP and spend anywhere between $1.99 (20) and $99.99 (1800) for more bucks. In other words, and in free mobile game fashion, No Zombies Allowed becomes easier or harder depending on whether you open your wallet. Ultimately, it all comes down to how much fun you're having, and our opinion of this game lies somewhere in the middle. There's something cool about maintaining a sense of normalcy during a horrific scenario. To that end, we think it's a cool change of pace from most zombie-themed titles available. 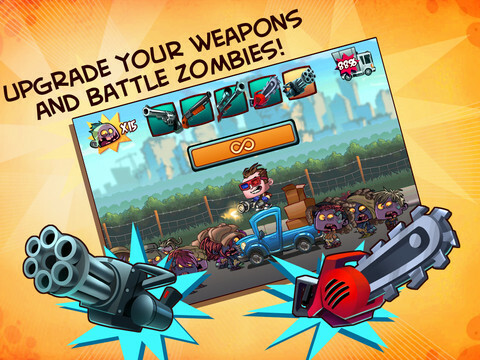 At the same time, No Zombies Allowed doesn't pack a big enough challenge, as the toughest parts have little to do with killing monsters or even managing personalities. Instead, it's all about wrestling with the decision to part with cash. We chose to keep ours. What's Hot: Creating a healthy economy during the zombie apocalypse, firing and/or evicting people, location data pulls actual businesses within the area, free to play. What's Not: Heavy reliance on in-app purchases, not much challenge whatsoever.